Just like any "kid" in a Japanese family, my American husband gets really excited when I make tempura. Home-style tempura is rustic and it's like our soul food. 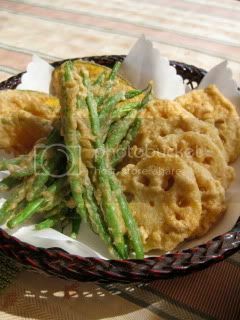 I always loved my mom's tempura as I was growing up. 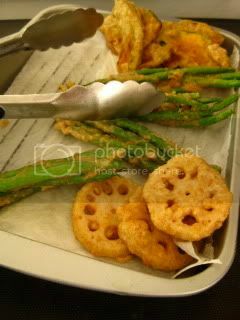 Whenever we did tempura in our family, we (or mostly I) couldn't wait until my mom finished frying everything and just started eating as the ingredients were fried. I've seen many different recipes of tempura before, but my tempura recipe has always been the very straight-forward "no trick" kind and I always love the result. 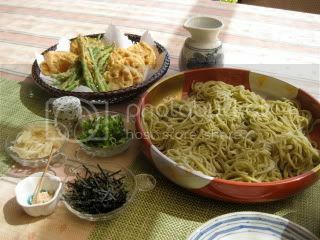 For lunch on a hot Sunday afternoon, I made vegetables tempura and served with cold green tea soba. Kabocha and lotus root were cut into 1/4" thickness. 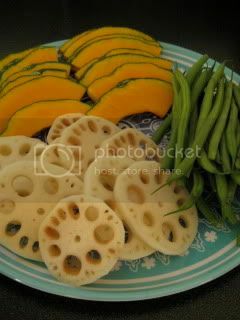 Lotus root slices were soaked in cold water for about 5 minutes, then drained and patted dry. Each ingredient was fried separately. It smelled so nice as the vegetables were cooked. I used the whole wheat flour for the batter, so I liked the color and texture of the finished crust. Once everything was ready, we set up our lunch at our patio table. 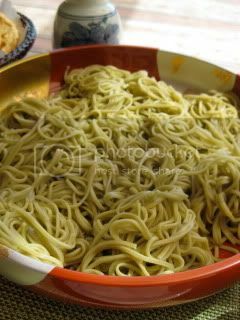 The same dipping sauce (my shojin dipping sauce) was used for both soba and tempura. 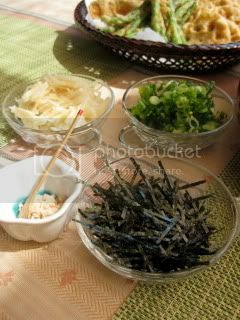 The condiments were plum salt, grated daikon, shredded nori, young ginger, minced scallion, and Kyoto black shichimi. Tempura was so crispy and packed with flavors and we just couldn't stop eating. Just the tempura with the plum salt made the very nice complete taste, too. What a wonderful lunch! I got so full and so energized. 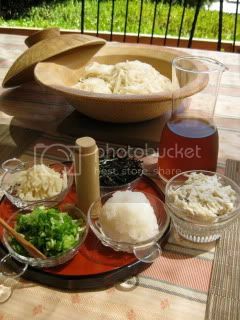 your choice of condiments, such as seasoned salt, grated daikon, etc. 1. In a large bowl, combine the whole wheat flour, baking powder, egg and water. Whisk by chopsticks. Add more water if the batter is too thick. It's okay for the batter to be somewhat lumpy. 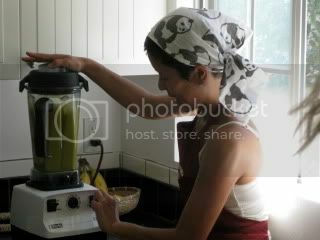 Don't whisk too much as the batter would get too dense. *Fry each kind of ingredients separately. 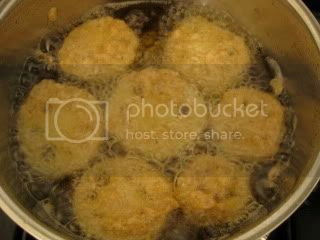 Do not overcrowd the frying oil. 3. Serve with the dipping sauce and condiments. 1. Combine the dashi stock, mirin, and soy sauce in a pot. As soon as it starts boiling, turn off the heat. 2. Cool down (to cold or room temperature). The last week of September turned out to have ones of the hottest days in this summer in LA. In fact, we had "the hottest" day ever in its recorded history. I barely survived it! 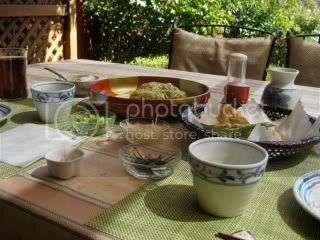 So, we got to enjoy the cold somen noodle lunch in our patio again. Noodles with crab meat, and many other condiments. We were so happy. Last Saturday, I hosted a new Donabe & Japanese cooking class. The theme was "Shojin (Buddhist-style vegan) Bento". So, we made the dishes which can easily travel on a picnic in bento boxes (or thermos for the soup) and can be enjoyed warm, cold, or at a room temperature. 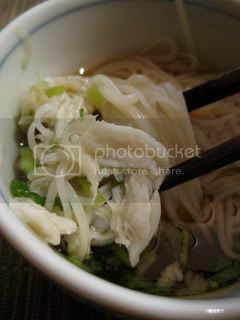 Shojin cuisine is, in fact, the base of traditional Japanese cooking. 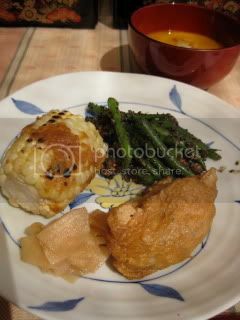 You don't have to be Buddhist or vegan/ vegetarian to enjoy shojin dishes. 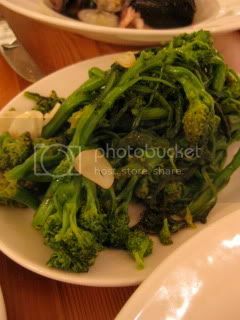 Many of the shojin dishes are something quite familiar at any Japanese household (or some are so sophisticated like what I had at Kajitsu in NYC!). I'm not a vegetarian, but when I eat a shojin meal, I don't miss meat at all. Shojin dishes are always so complete and satisfying to me. 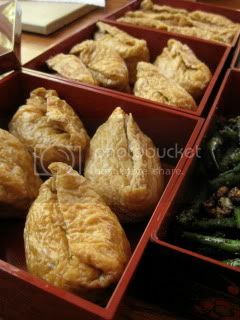 Lotus Inari Sushi...Abura-age (fried tofu pouch) was simmered in the seasoned broth in a classic-style donabe pot. Meanwhile, we made the sushi rice (cooked with the double-lid donabe rice cooker, "Kamado-san") and lightly-pickled lotus root slices were folded in. The sushi rice was stuffed in the seasoned abura-age. 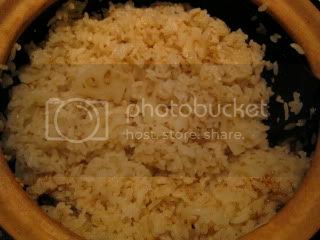 This is a very popular picnic rice dish in Japan. You can just pick a piece by hand and bite into it, so it's easy to eat, too. Haricot Vert "Goma-ae"...First, the roasted sesame seeds (both black and white) were ground in the mortar and pestle and seasoned with sake, soysauce, sugar, and karashi mustard. 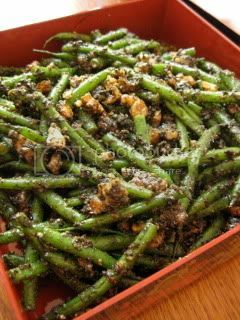 Blanched haricot vert and roasted walnuts were folded in. "Goma-ae" is another very popular dish at Japanese homes. We normally have it cold or at a room temperature. 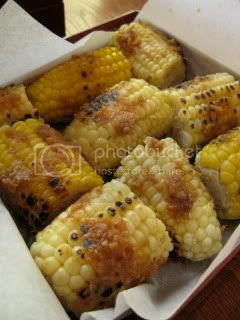 Roasted Corn with Shojin Dengaku Sauce...The corn-on-the-cobs were "steam-roasted" in the tagine-style donabe, "Fukkura-san". Then "Dengaku" sauce (miso-based sauce) was spread all over the corn. Regular dengaku sauce would contain egg yolk, but this "shojin" style dengaku sauce was made with our homemade miso, mirin, and also our homemade ume-shu (plum liquor). Cold Kabocha "Suri Nagashi" Soup..."Suri Nagashi" is Japanese-style potage. The soup itself is made of only 4 ingredients (kabocha pumpkin, shojin dashi stock, saikyo white miso, and sea salt). 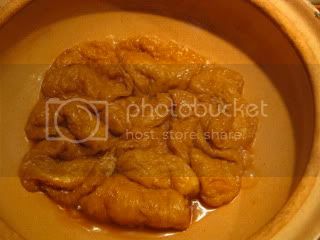 Kabocha was cooked in the shojin dashi stock in the soup & stew donabe, "Miso-shiru Nabe" until tender, then they were blended with the rest of the ingredients. No cream or butter, of course, but it tastes so creamy and soothing. 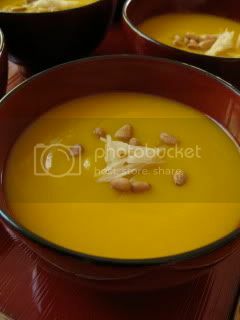 The soup was garnished with the thinly-sliced young ginger ("shin-shoga") and roasted pine nuts. 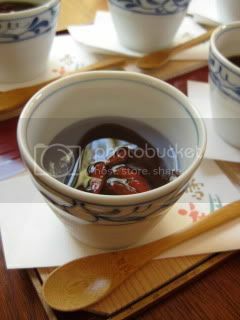 With these shojin dishes, we had the extremely dry sake from Yamagata. 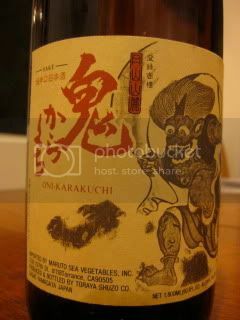 It was Junmai Oni-Karakuchi by Toraya Shuzo. 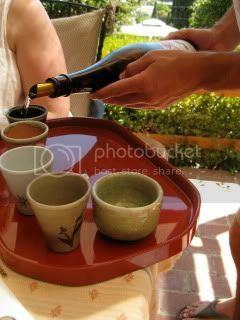 In the very warm weather, the crisp dry sake tasted especially nice and it was a wonderful pairing with all the dishes. 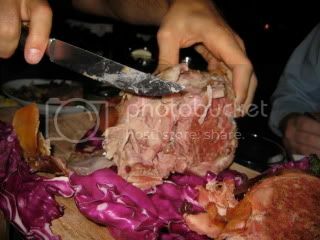 At the end of the meal, we tasted my homemade Okinawa Purple Yam Blanc Mange with Okinawa Black Sugar Sauce. It's also a shojin dish. The blanc mange has the purple yam flakes, soymilk, raw brown sugar, rum, and gelatin. It made the nice ending! The tasting took place in our little gazebo in our front yard. Most dishes were served right out of the lacquer bento boxes. What a perfect day it was to do an outdoor "bento" lunch! I am really happy that my shojin-theme classes are becoming more and more popular. We had several people on the waiting list (I'm sorry to those who couldn't get in! ), so I want to do another shojin bento class next month. Lastly, and most importantly, I always feel so lucky to meet really wonderful people at every class. They always give me energy and inspiration, and I am grateful for all the positive feedback from them! I am excited to share the report about this class by Ms. Amy Tan. Please check out her blog entry here. Amy, who is a talented artist, also included a beautiful illustration artwork and I love it so much. Thank you, Amy! It was already the 4th and last day of my stay in NYC. I was going to take the night flight from JFK back to LA. Yet, I got to make the most out of the remaining time in the city. 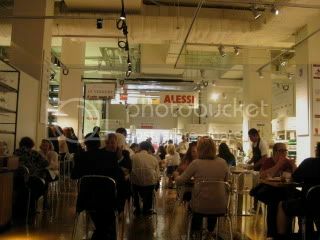 I went back to EATALY New York with my friend’s mom, and this time, we had lunch there! 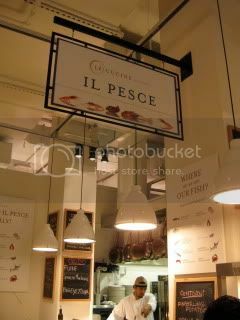 We decided to try their seafood restaurant, Il Pesche, and luckily we got there right before it opened at 11.30am (the market opens at 10am). 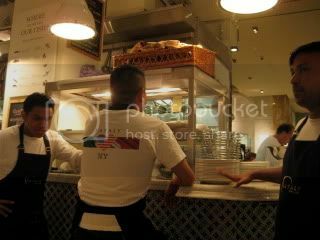 At the same space, you could also choose the vegetable menu, instead of seafood menu. 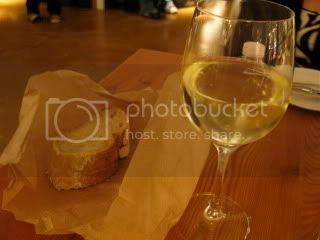 I had a glass of Arneis from Piemonte (can’t remember the producer). Soon after we got our table, the space started to fill up quickly. By the time we finished our lunch, I overheard the waiting was already almost 1 hour. 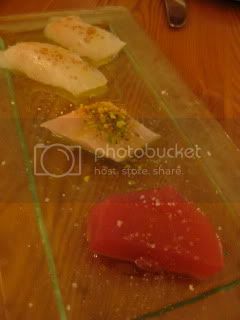 Crudo…Fluke, Spanish Mackerel, and Big Eye Tuna. Super fresh, and each fish was seasoned differently. 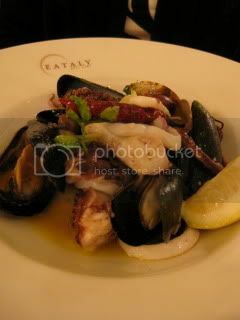 Warm seafood salad…my favorite was the octopus. So tender. 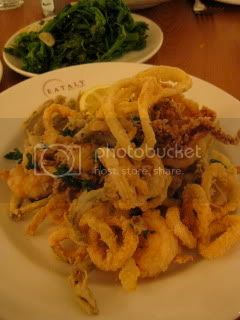 Fritto Misto and braised Rapini…seafood was fried perfectly. They were light and crisp. Wonderful lunch! The cost was about $90 after tax and tip for two of us…it might not be the most reasonable lunch, but for the quality and ambience, I thought it was so worth it. 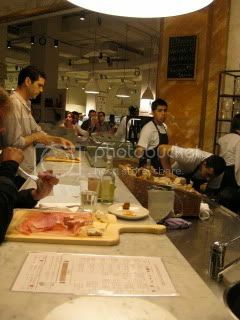 Next time, I would also love to try the standing table for a plate of assorted freshly sliced charcuterie and wine! After lunch, we walked from 23rd Street/ 5th Ave. to 45th Street/ Broadway. The weather was so gorgeous. 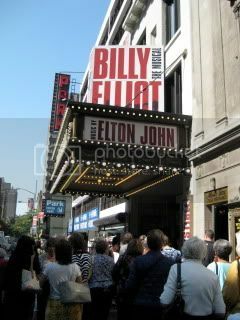 We went to see Billy Elliot and it was amazing!! We got the best seats (6th row center orchestra, which is much better than the first 3 rows because they would be too close to the stage). I was so entertained the whole 3 hours of the show and want to see it again. It was definitely one of my top 3 theater shows of my life so far!! It was already the final evening of my stay in NYC in this trip. Too little time to try all the good food! 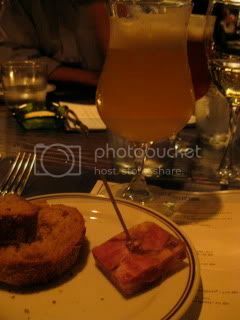 My friend had made a reservation for a whole pig roast dinner at DBGB Kitchen & Bar, which is Daniel Bouluud’s casual brasserie specializing in sausage and artisan beer. Some of her friends as well as another friend of mine joined, so there were 7 of us. 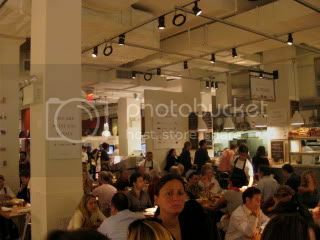 The restaurant is so stylish and lively. 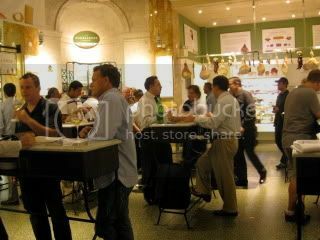 The large dining area was absolutely packed for the whole evening. 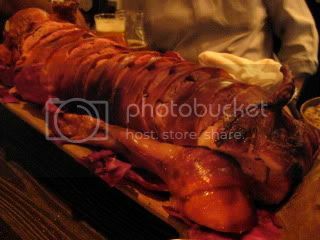 We were, in fact, so lucky to have got to reserve for the pig roast dinner, because they roast only one pig for one group per evening! 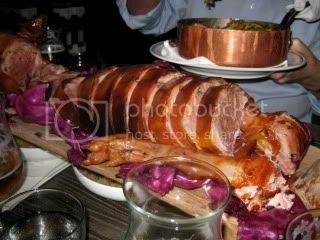 The special pig dinner includes the whole suckling pig, appetizer, side dishes, dessert, and endless artisan draft beer from the list! Fromage de Tete…Gilles Verot’s award winning chilled pig’s head terrine. Beers were so nice, too. 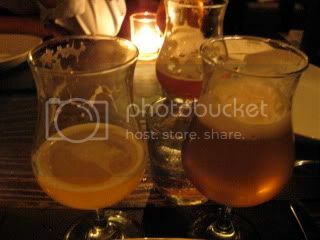 My favorite was Ommegang Witte, Belgian-style white (wheat beer from NY). The main event…Roasted Suckling Pig! 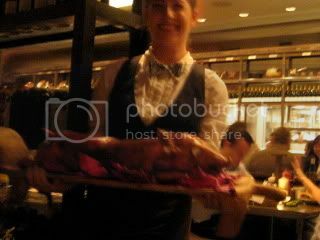 Our server first presented the whole pig to our table before slicing them. 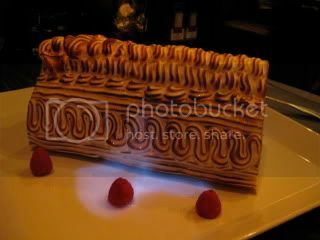 It was quite huge (I could easily feed more than 10 people!). 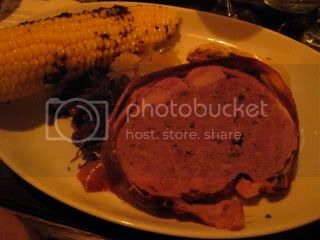 The meat was cooked like pate-style. It was stuffed with bacon and fine herbes. 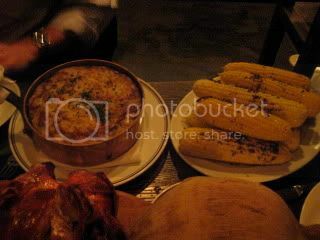 The pig roast was served family style with Swiss chard-gruyere-potato gratin, Housemade red & white sauerkraut, and Truffled corn-on-the cob. We kept eating and eating the pig, and there was still so much. We also cracked the head open for more meat. My favorite part was the cheek meat…it was so oily, juicy, and just filled with flavors. Everything was so delicious and really rich. 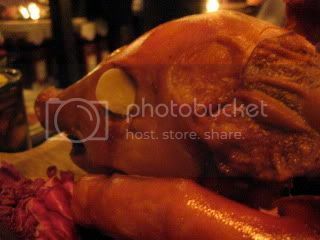 As an Asian, maybe I would have appreciated the pig even more if the skin was crispier and juicier. Their focus was definitely on the meat inside, instead of the skin. 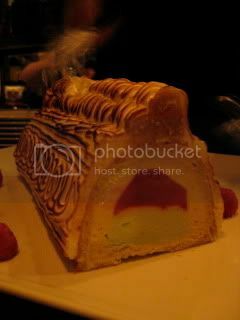 The dessert was Baked Alaska..Vanilla & verbena ice cream, raspberry sorbet, fresh meringue flambee with chartreuse. 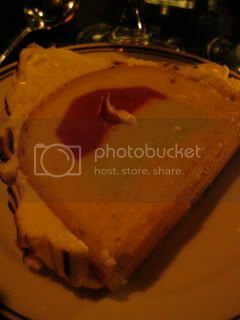 The cake was set on fire at the table and it was a nice presentation. Oh boy…I was seriously full after the dinner. It was A LOT OF FOOD. I had a great time. Both the food and the beer were excellent. I would so love to come back here next time to try their regular menu.